Legend Brands Restoration | Are You Making Your Disinfectant Ineffective? Home Tech Tips Are You Making Your Disinfectant Ineffective? Are You Making Your Disinfectant Ineffective? Cleaning and restoration professionals know that EPA-registered disinfectants must be used exactly according to label directions. This is repeated so often that people become immune to it. But beware, there are important reasons – beyond liability and avoiding fines – to follow labels. 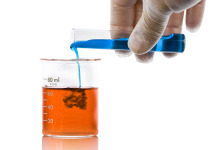 One rarely discussed aspect of disinfectant chemistry relates to destructive contaminants. For example, commonly used chlorine-based disinfectants are very sensitive to contamination. Even a small piece of steel, such as a fragment of a broken staple, will catalyze the destruction of the available chlorine, i.e., the breakdown of a molecule and its chemical properties. The challenge is that you rarely see these contaminants fall in. Another type of contamination arises from good intentions when someone tries to “boost” a disinfectant and decides to add a little detergent. This might seem like a good idea, but there is a hidden consequence. Many disinfectants have active agents known as "cationic surfactants." The cationic part of the molecule kills the germs and is positively charged. However, most general purpose detergents depend on an "anionic surfactant," which is a negatively charged molecule. Positive and negative charges neutralize each other. Typically, this makes the solution cloudy. But what you can’t see is that the solution is no longer effective. There are plenty of other examples of how contaminants destroy disinfectants, so take the label seriously and don't add anything unless the label expressly says you can. Copyright © 2019 Legend Brands. All Rights Reserved.